Lisa Alyounes, a 4ft 9in woman was caught on video pummeling her “cheating” boyfriend on a train. A video showing Lisa Alyounes, 26, during her brutal revenge on a man aboard a New Jersey Transit train has gone viral on the YouTube channel “Train Fights”. Lisa Alyounes, identified by police arrest records, curses her boyfriend and thumps him in the head with her fists, kicks him in the face with her Ugg-style boots and spits on him to show her contempt. The woman’s assault delayed hundreds of commuters and held back all trains between Camden and Trenton New Jersey. The fight took place November 29 on the River Line train at a station in Camden, outside Philadelphia. The train was 20 minutes late leaving the 30th Street station because police had to pull the woman off the train and arrest her, transit spokesman John Durso Jr. said. All other trains in both directions on the route were delayed 15 minutes as a result, John Durso Jr. added. In the attack, which was filmed by two passengers, the boyfriend, who was not identified, remains seated and tries to shield himself from the angry volley. The man does not hit her back. Lisa Alyounes seems to hurt him, but at 4-foot-9, she doesn’t appear to inflict much damage. Horrified passengers in her train car yelled at the woman to stop and warned her police were on their way, but stood by during her violent tirade. “Two f****** years with me, and you’re going to cheat on me!” Lisa Alyounes screams. “That’s all for cheating? That’s all he did?” the woman behind the camera asks. When officers arrived, they hauled Lisa Alyounes off the train. The camera keeps rolling as she resists their attempts to handcuff her and then kicks the officers as they take her away. Lisa Alyounes was charged with resisting arrest, assault on a police officer, domestic violence assault and disorderly conduct. 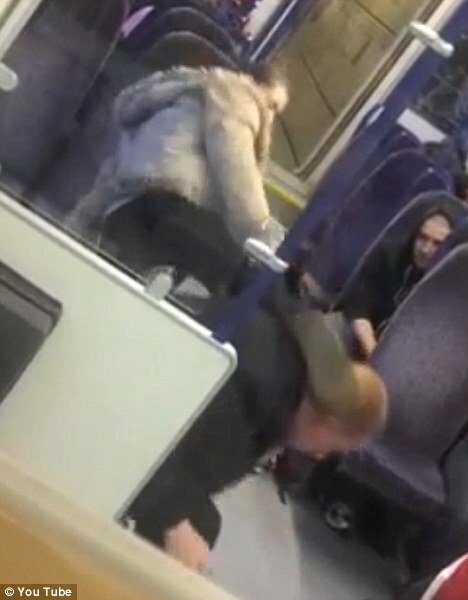 4ft 9in woman who was caught on video pummeling her 'cheating' boyfriend on a train.